"I would die in the name of my religion and if someone has committed blasphemy, then they are not forgiven." "If the supreme court has some faith in religion and if they are Muslims, they should execute her." "We believe that our case was on merit and she deserves the death sentence according to the law." "Many women of the village, when they heard about this judgment, they were in shock. This is how strongly people feel, because this incident was so strong and so clear and in front of so many people." "If you start forgiving people on this issue, then it will become routine that people will commit blasphemy and just ask for forgiveness." "She confessed her crime in front of them, how can they forgive her?" "This case has given an enormous loss to this country, so many people have been killed and peace has been disrupted." "If she had not uttered these remarks, then things would not have turned out this way." Ittan Wali is the rural village where the Christian Pakistani woman known as Asia Bibi lived with her husband and their five children in a one-room house with a gate painted bright blue. This agricultural village is where many of the women of the who live there work in a nearby orchard that is now planted with lemon trees but in 2009 was planted with falsa bushes and where Asia Bibi and a number of other women went out to harvest berries on a hot June day. Asia Bibi was among a few other Christian women while there were about 25 Muslim women in their harvesting crew. Two of the Muslim women refused the use of a water vessel because Asia Bibi had used it. An exchange ensued and it was during that heated argument that the Christian woman is held to have insulted the Prophet Mohammad. It is forbidden, the two Muslim women argued, for a Christian to drink from a vessel meant for Muslims. When the owner of the field was made aware that his workers were engaged in a religious dispute he dismissed them from the work detail, informing them they were not welcome to return. Back in the village the two Muslim women who deplored Asia Bibi drinking from the vessel conferred with a local cleric. Soon afterward there was a summons for Bibi to attend a village council to explain herself; that is when local villagers claim the Christian woman confessed to having maligned the Prophet. Police arrived to take her into custody charged with blasphemy, though she denied any such thing and described having been dragged through the streets by a mob, beaten close to unconsciousness. She spent seven years in prison then sentenced to death under Pakistan's strict blasphemy laws. The lawyer working on Asia Bibi's behalf had her appeal the sentence and the country's supreme court agreed to hear the case. Their conclusion was that the confession was not a voluntary one "and nor can it be relied upon to form the basis of a conviction, especially for capital punishment". And they decided she should be free of any further persecution. Her plight had moved two high-placed Pakistani officials to defend her and it cost them their lives, both assassinated as traitors to Islam, though one was Christian. 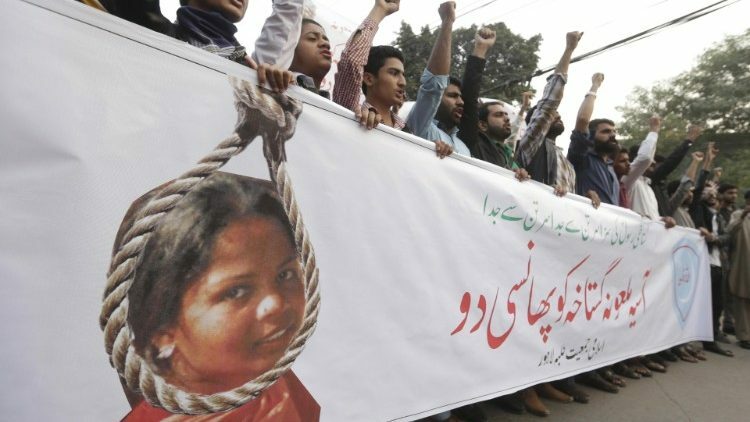 When the Supreme Court acquitted Asia Bibi on appeal, a wave of protests was unleashed across the country with roads and highways blocked amidst a massive outcry. Leading the new government to agree with a petition to review the decision. Until that review takes place Asia Bibi remains in protective custody. She and her family have pleaded for haven abroad. Britain's huge Pakistani Muslim community has by its very presence and the potential of backlash, convinced Britain not to offer asylum to the woman even though a substantial presence of Christian Pakistanis in Britain has vowed to protect her among themselves. Protesters engaged in clashes in Pakistan's cities, attacking police arriving to restore order in the villages. Mohammad Bota of the village where Asia Bibi's relatives had lived, informed foreign reporters that the village welcomed Christians and that no one had made any effort to molest them. 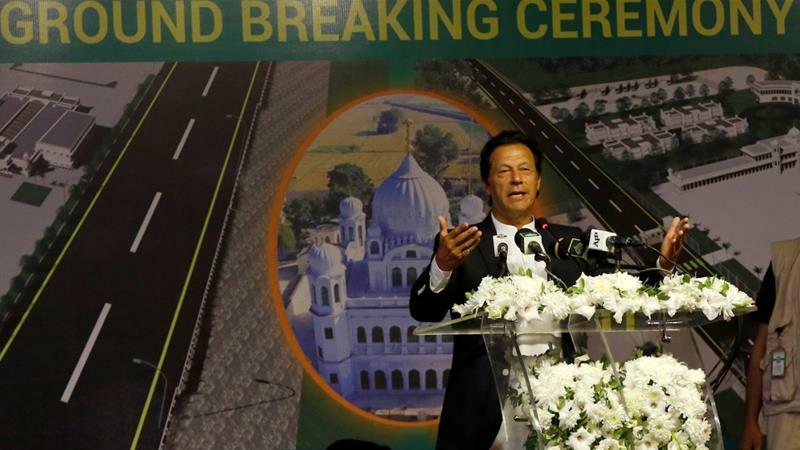 The experience of the assassination of Punjab's governor and the minorities minister both of whom had spoken on Asia Bibi's behalf, however, convinced the family they could never be safe attempting to continue living in Pakistan. According to a Christian group in Britain which has reached out to help the family, door-to-door vigilantes have been attempting to find them. And it would most certainly not be for an opportunity to pledge friendship. "Mullahs had been reported in their neighborhood going from house to house showing photos of family members on their phones, trying to hunt them down. The family have had to move from place to place to avoid detection", according to John Pontifex of Catholic group Aid to the Church in Need U.K.
"In Pakistan, 44 percent of children under age five have stunted growth due to nutritional deficiency. Our high infant mortality rate is associated with malnutrition in mothers." "These eggs can add a healthy ingredient to their diets." "They [chickens] can live in trees, in boxes, or under people's stairs. They can eat kitchen scraps instead of expensive feed, and they can outrun predators like cats and foxes." "People may laugh at the prime minister over this, but I laugh at them. It is a wonderful idea." Here in the city people have money to spend, but they can't find a single pure thing to eat." In Pakistan a rural, agricultural country with a population of 208 million people, raising chickens is commonly practised. Yet wealthy industrialists who made fortunes investing in cement or the production of textiles have turned to the egg market and have pretty well swept it up, producing factory-farm eggs, mass produced in high-tech poultry facilities. Their eggs are relatively inexpensive, and Pakistanis claim they are also tasteless and lack nutrients. The factory bred chickens have been bred to lay more eggs, larger, whiter, but lacking flavour. Now, the new government of Prime Minister Imran Khan has embarked on a country-wide experiment which when it is ready to go, will provide free chickens to impoverished villagers. Each person who registers with the new program will have a rooster and five hens delivered to them to begin their very own personal enterprise; to feed their families and to sell the excess eggs for profit. At Pakistan's Poultry Research Institute in Rawalpindi, newborn chicks are taken from incubation trays, injected with a vaccine against Newcastle disease, and placed into plastic containers to travel in heated trucks to government farms to be raised to maturity. Twice a week at the Punjab Province poultry research centre this process is repeated as the initial step in a national anti-poverty program meant to profit several million poor families. 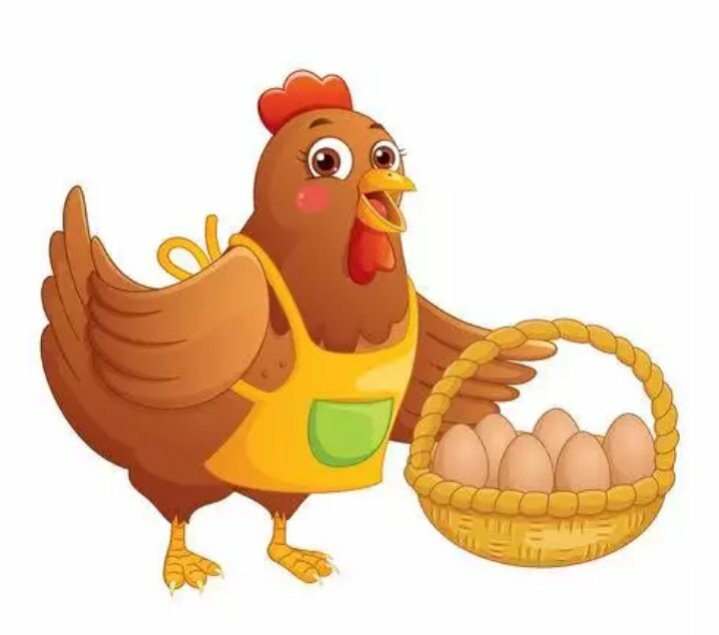 Authorities estimate that five hens laying several eggs each weekly would bring in around $75 monthly to women in poor families selling their excess eggs. That amount represents more than the salary of a security guard or a construction worker. Crossing hardy domestic hand-raised chickens, called "desi", native to the country, with breeds from Egypt and Australia or with Rhode Island Reds, birds have been developed with the qualities required for backyard life. A tough, omnivorous, disease-resistant and agile chicken. Bearing in mind that the population of Pakistan is overburdened with poverty, think about the billions that the U.S. has given Pakistan over the decades and it was all to fund the Pakistani military and the secret service intelligence agency; none trickled down through the economy to the population at large. Pakistan made the choice of earmarking enormous sums to acquire an atomic warfare arsenal, ignoring the plight of its people, susceptible to floods and famine. Pakistan's malevolent, violent machinations through Islamist jihadi groups and the nation's military exercising vicious attacks against its neighbour India has cost it greatly; this is a nation that plots against another neighbour, Afghanistan, supporting the violently disruptive Taliban to ensure instability in Afghanistan, while achieving nothing of any value for the geographic area, much less Pakistan itself. "Suddenly, a one-metre [3.3-foot] wave hit me. I was thrown into the fence of a building about 30 metres from the beach and held onto the fence as strong as I could, trying to resist the water, which felt like it would drag me back into the sea." "The tide rose to the surface and dragged all the people on site." Indonesia represents a vast archipelago of over 17,000 islands, and has a population of over 260 million people who live along the "Ring of Fire", an arc of volcanoes and fault lines situated in the Pacific Basin. Saturday's tsunami was caused, in all likelihood, by a flank of the volcano collapsing; a large area of the volcano's slope giving way triggering a landslide or beneath the ocean, a disruption powerful enough to be capable of producing gigantic sea waves. In 2004, a massive magnitude 9.1 earthquake hit Indonesia, spawning a horrendous tsunami off Sumatra Island which killed over 230,000 people in a dozen countries, most of them in Indonesia. Anak Krakatau volcano is considered to be the successor of the historical Krakatoa volcano that erupted massively in 1883, known to be the most devastating such event in recorded history, an event where over 30,000 people lost their lives when tsunamis ensued and so much ash crowded the sky that a drop in global temperature was recorded. The explosion destroyed the huge volcano, sinking much of the island in the Sunda Strait between Java and Sumatra between the Indian Ocean and the Java Sea until around 1920 when Anak Krakatau began rising from the site, growing each year, and periodically erupting, considerably smaller though it is than the original Krakatoa. 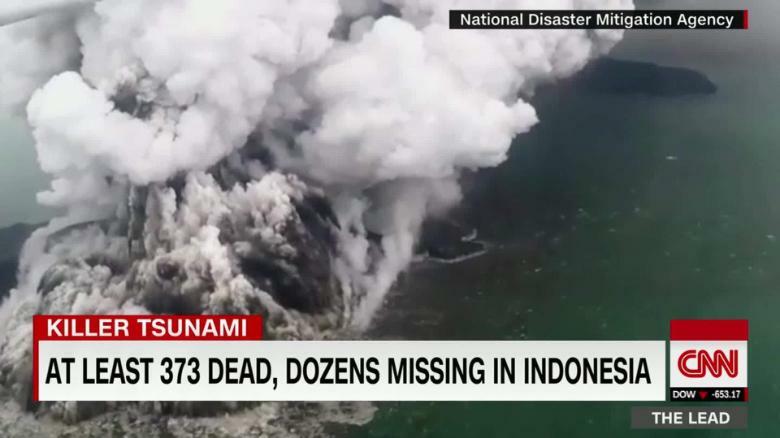 Although scientists, along with some from Indonesia's Meteorology and Geophysics agency, felt the tsunami could have been caused by landslides below water; alternately above ground, on the steep slope of the Anak Krakatau volcano, tidal waves caused by the presence of a full moon were also cited as potential causes. 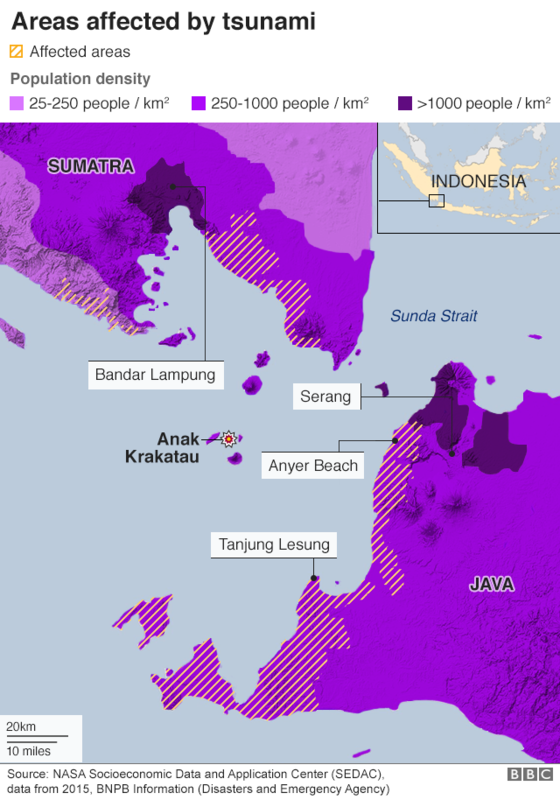 Nine hotels and hundreds of homes were damaged or leveled by the waves in the city of Bandar Lampung on Sumatra. At last count, 375 people lost their lives, 1,459 were injured and another 128 people are missing. All together, to date, 5,600 people have been displaced by the disaster. An astonishing 558 hotels were completely destroyed throughout the range of the tsunami's effects, and 60 restaurants, 350 boats and 9 hotels were heavily damaged. The cost in human lives and property destruction is enormous, particularly for a country that had experienced a deadly tsunami on the island of Sulawesi in September, caused by a powerful earthquake, when 2,500 people were killed. Saturday night's tsunami came without warning to alert people to rush to higher ground. The waves ripped buildings from foundations in seconds. "Everyone is focusing on building roads, building houses, building hospitals after war. [There is a lack of attention to] the collective trauma." "Very few people focus on the lives, on helping bring back the happiness. It is not easy." "There is a lack of reliable data to capture the true burden of the mental health, but it's probably much more than the numbers the government is putting out." "Some of the issues are probably more prevalent in the north and east. But the main disorders -- depression and anxiety -- are across the board." "He always lapses into grief at this time [anniversaries of relatives' deaths in the war]." "He keeps it all bottled up and denies feeling upset or unhappy. At least we women talk to each other and cry if necessary. He won't do that, ever." Villagers stream one by one with little blue books representing a personal chronicle of their history of loss dating from the Sri Lankan civil war when government forces struck against the separatist Tamil Tigers rebel militias into Dr. Jegaruban's (known as Dr. Jegan) office. 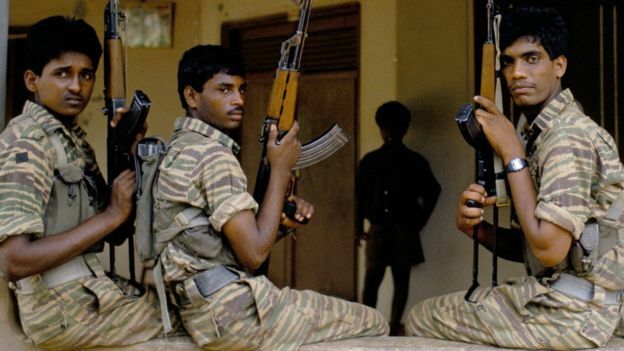 The Kilinochchi district with its 130,000 residents experienced some of the worst fighting between the Tamil Tigers and the Sinhalese majority Sri Lankan Army. 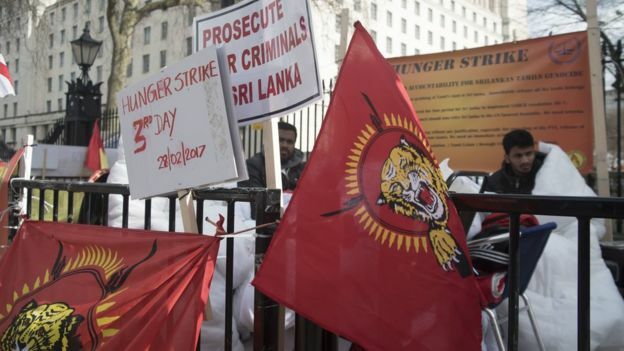 The butchery carried out by both sides in their lethal conflict targeted mostly Tamil civilians, caught between the two armies and used by the Tigers as a living barrier. According to government estimates about ten percent of Sri Lanka's 22-million population suffer some form of mental disorder; close to 800,000 are held to be suffering from depression. Research, on the other hand, suggests that the government figures represent an under-estimation, particularly in the northern areas of the country where fighting was concentrated. According to studies in the northeast the prevalence of post-traumatic stress disorder among children runs as high as 30 percent. Among the ten highest suicide rates in the world, Sri Lanka is badly in need of some workable solution to the plight of its traumatized population. Infrastructure improvement for hospital access, restrictions on deadly pesticides convenient for people's use in committing suicide have seen some improvement. However, police continue to register about ten deaths by suicide on a daily basis, while activists estimate the number higher at 15 daily. An additional 100 to 150 people attempt suicide each day. Government psychiatrists like Dr. Jegan struggle to meet the demand for treatment from people suffering from this national malaise. More often, however, given the numbers involved, a burden falls upon volunteers in the population coming from all streams of society, from retired bankers, former nurses, local businessmen, trained as counselors who answer calls at suicide hotlines or render assistance with programs such as Dr. Jegan's. Based in Kilinochchi where some of the worst fighting occurred -- since it was the Tamil Tigers' capital -- the need is greatest there. The brutal offensives against the Tamil Tigers that President Mahinda Rajapaksa embarked upon caught the rebels in Kilinochchi surrounded by the Sri Lankan Army closing the area to international observers where all hell broke loose. 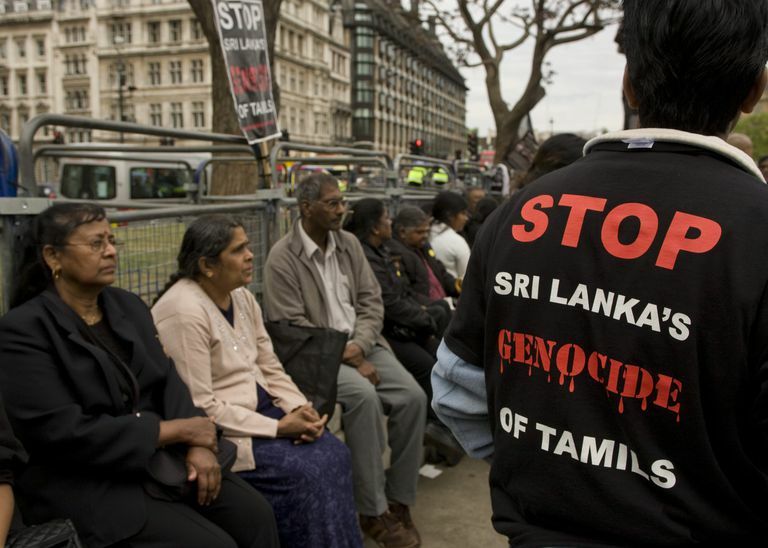 Accusations of war crimes by the United Nations went deliberately unnoticed by the government. The entire population of the area became displaced, with the United Nations claiming some 40,000 civilians were killed as the war wound up. Now, Dr. Jegan goes door to door in the area villages breaking a taboo around mental health that kept many people away from seeking help, to avoid being stigmatized. He handed out little blue books and urged people to record their painful wartime histories. Typical of such histories, he read aloud to one patient in her 60s sitting quietly before him, her entry: "Husband died of heat attack, one daughter died of war, a sister committed suicide". Committing their grief to paper, allowing the psychiatrist to know their history, hearing their story from his mouth, a communication that may begin a gradual healing process. When 67-year-old Ulaganathan Nagendram came along with his wife, fearing her husband was in the throes of a heart attack, Dr. Jegan was unable to detect anything physically awry with the man. What was Mr. Nagendram worrying about, he asked the man's wife. The answer: Two sons killed in the war; the anniversary of one of the deaths had just passed. "The natural disaster [2004 tsunami which killed 31,000 Sri Lankans] was a one-off catastrophic event that left a trail of destruction and loss. But it did not continue to exert a prolonged effect. As a result the severity of the collective trauma was much less. In fact, having lived through a prolonged war situation has meant that Tamil communities have learned skills and strategies that make them better able to cope with disasters." "Apart from attending to the immediate basic needs and other acute problems in the rescue and relief phases after a major disaster, rehabilitation, reconstruction and development strategies need to include collective-level interventions. In fact, our experiences show that many individually oriented mental health interventions appear to fare much better when undertaken within an overall framework of a community strategy." "We had decided last week to launch a military incursion in the east of the Euphrates River. Our phone call with President Trump, along with contacts between our diplomats and security officials and statements by the United States, have led us to wait a little longer." "[We would prefer to hold off] until we see on the ground the result of America's decision to withdraw from Syria [though delaying the operation should not be confused with its outright cancellation]." "Of course this is not an open-ended waiting process." "We don't have our eyes on anyone's land. Yet, our stance regarding any attack to originate from Syria is clear. We can make no concession on security. The ongoing incidents in Syria, both in their security and humanitarian respects, are of direct concern to our country." "[The Kurds of the YPG have] talked about maybe even releasing thousands of ISIS prisoners so they can use the men guarding them to help with the fight against Turkey, if that's what's going to come [though a YPG spokesman denies this]." "The general concern — Britain, France and elsewhere in NATO — is that this U.S. troop withdrawal could lead ISIS to regroup and have a resurgence. It's lost most of its territory, but it has many supporters still lying low in both Syria and Iraq." "What Turkey is going to do is unleash holy hell on the Kurds." "In the eyes of Turkey, they're more of a threat than ISIS. So this decision is a disaster." President Donald Trump, left, talks to Turkish President Recep Tayyip Erdogan as they tour the new NATO headquarters in Brussels, Belgium, July 11, 2018. "A major clue to understanding Trump’s unexpected action was provided by an unnamed U.S. official quoted by Reuters who said that the decision had come after the phone call between Trump and Turkish President Tayyip Erdogan on December 14. The official added, “Everything that has followed is implementing the agreement that was made in that call.” According to a senior Turkish official quoted by ABC, Trump told Erdogan during the call that “he was planning to pull U.S. troops out of Syria.” In fact, Trump’s move came as long-standing U.S.-Turkish differences over northern Syria had once again threatened to flare up into a major dispute between the two countries." "On December 12, Erdogan had once again denounced U.S. military engagement with the Syrian Kurdish People’s Protection Units (YPG)—identified by Ankara as an integral part of the Kurdistan Workers’ Party (PKK), which Turkey has been fighting for decades—in the context of the ongoing fight against the Islamic State under the umbrella of Syrian Democratic Forces. 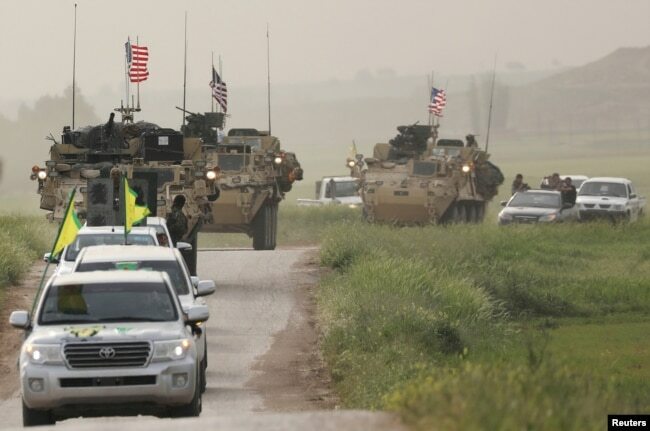 After registering his usual complaints about the provision of “20,000 truckloads and over 3,000 planeloads of military supplies” to YPG and the failure of the United States to implement the June roadmap the two countries had agreed to in June 2018 involving the departure of Syrian Kurdish elements from Manbij, west of the Euphrates, Erdogan had threatened to send Turkish troops into the area between the river and the Syrian-Iraqi border where U.S. forces were stationed “in a few days” to “cleanse it of terrorists.” Confirming that there would be “no hostility against U.S. soldiers in Syria,” Erdogan said, “in spite of everything, we continue to see the U.S. as a strategic ally with whom we can advance together in the future if we can agree on the right basis." No prior consultation with is national security team or allies and despite objections from everyone with a stake in the struggle against Islamic State in Iraq and the Levant, President Donald Trump made his decision to abandon the U.S. alliance in its combat strategy with the Syrian YPG and withdraw the two thousand U.S. troops and the American air cover mission in Syria against ISIL. This, according to American and Turkish officials, both speaking on condition of confidentiality and for obvious enough reasons. The reversal that has the effect of ceding the entire area of that portion of the Middle East to Iran, Turkey, Hezbollah and Syria, took everyone by surprise, including the president's Cabinet, U.S. lawmakers and their international allies. None more so, however, than the Kurds for whom this will mean an all-out war with Turkey, not of their choosing, but which will have been imperiously imposed upon them by an Islamist dictator whose mission appears to be the entire eradication of Kurds from the territory; by lethal means, preferably. A telephone call between Trump and his Turkish counterpart on December 14 led to Trump agreeing with Recep Tayyip Erdogan that the United States need no longer linger in Syria, that Turkey was more than capable of wiping out what was left of ISIL, as though that constituted a swift mop-up operation of several hundred hold-outs. Lost in the conversation was that ISIL leaders had Turkey's backing and Turkey was a willing conduit for ISIL oil out of the 'caliphate'. 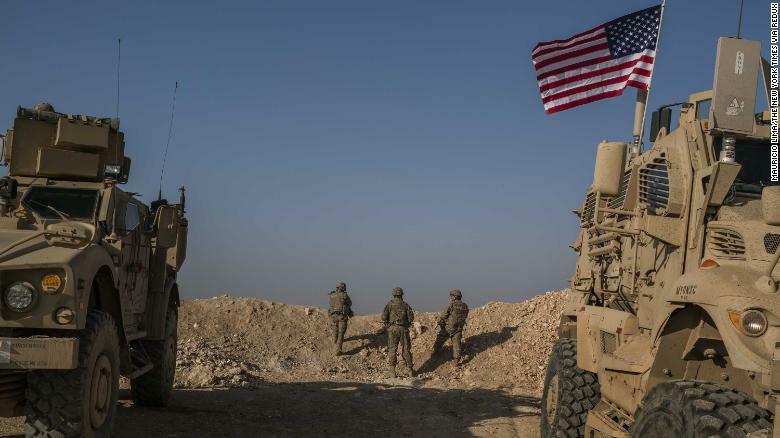 Seemingly oblivious of the death sentence he would be imposing on loyal, courageous Kurds, Trump blithely announced the U.S. troop evacuation from Syria. 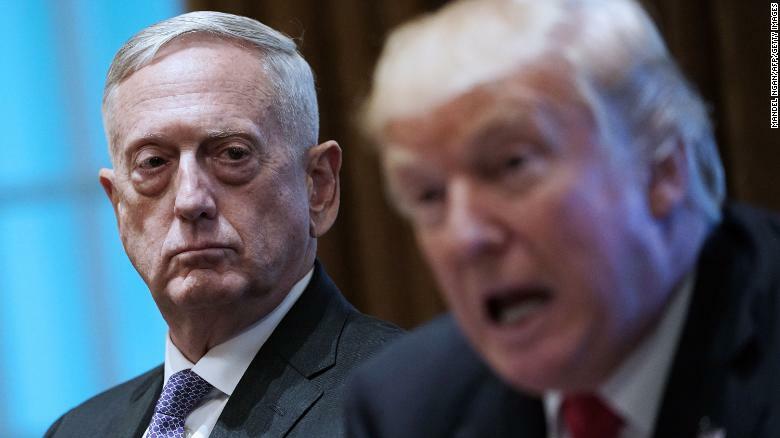 Defence Secretary Jim Mattis, along with several other ranked Cabinet members urgently sought to persuade Trump of the necessity to reverse his impulsive decision; at the very least to suspend it for the time being, but to no avail, leaving General Mattis little option but to tender his resignation for it was obvious there was nothing more he could do to protect his country and the world at large from the moral ravages being imposed upon it by a president he could no longer address as 'his' president and commander-in-chief. Neither the U.S. State Department nor the Pentagon can be in much of a celebratory mood in the past week. The estimated tens of thousands of ISIL fighters remaining in Iraq and Syria and the continuing attacks they have mounted will be certain to result in a restoration of their influence in the region with the absence of an American military presence in Syria. 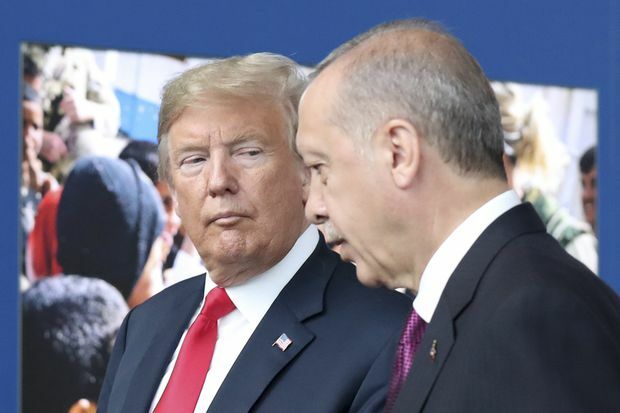 A list of talking points had been prepared for Trump by members of his team; including Pompeo and Mattis; a list he disdained to use and simply ignored, particularly the note impelling Trump to compel Erdogan to back off his threats. Where Trump on a previous occasion had convinced Erdogan that an attack on the Kurds should be shelved, no such advice was advanced on this occasion. U.S. Central Command chief General Joseph Votel on Wednesday informed his commanders in the field and their Kurdish allies of the stark and startling decision on the part of the President of the United States for whom the very concept of 'allies and courage and loyalty' appear to be completely alien. "We must do everything possible to advance an international order that is most conducive to our security, prosperity and values, and we are strengthened in this effort by the solidarity of our alliances." Handing in his resignation from his two-year posting as Secretary of Defense, 68-year-old James Mattis has seen much throughout his professional career. It was time for him to resign, he averred, noting that President Trump required someone at the Pentagon's helm "better aligned" with his views. Though who that someone might be remains as yet a mystery, given that possible successors all appear to agree that Mr. Trump's decision-making process absent advice-seeking from those whom he selects for that very purpose, is insensible and unreasonable. This is a man of unmitigated hubris whose instinct is to overrule those put in place to balance his volatile decision-making born of complete ignorance of the details of any given subject at hand. Involuntarily retired from the Marine Corps and his position at U.S. Central Command in 2013 by an Obama administration which had no admiration for the forthright position of a man of his calibre, openly critical of the U.S. lead in negotiating with the Islamic Republic of Iran, General Mattis felt he could no longer be of use to the American public in his Trump administration role. Without a doubt there is no deliberation nor action that President Trump has made that his Secretary of Defense agreed with, without gently persuading him to a modified alternative. The impulsive decision, despite ample warning it would come eventually, to withdraw U.S. troops from Syria, leaving the field open to Russia, Iran and Turkey, and abandoning the Kurdish population to the vagaries of 'good luck' in opposing Turkey's annihilating plans for the group he abhors is profoundly disturbing at the very least, as is leaving Israel wide open to Iranian/Hezbollah/Syrian existential vengeance. The United States, pointed out General Mattis in his two-page letter of resignation, is honour-bound to stand by its allies. His country, he emphasized, draws its moral strength from the relationships it nurtures and respects with its allies. The county he loves has an obligation to remain alert and "clear-eyed" in its view of threats from outside sources, Islamic State group included. Now, however, the threat to U.S. stability and its stable relations with its circle of like-minded allies is threatened by none other than the casual decision-making of the President of the United States himself. There are new allies on the horizon, allies that the American people and their government would hardly have anticipated before the 2016 presidential election that upended all that was considered normal in that politically divided country. In Moscow, Vladimir Putin has expressed his approval of Mr. Trump reaching the "right decision". Iran and Turkey also are pleased with this turn of events. North Korea has not yet been heard from. Some observers lament the fact that the 'last adult' has left the room, leaving infantile Trump to his own devices. "[It is importance to maintain] the post-World War II alliances [and] a clear-eyed understanding of our friends and foes." "It is regrettable that the president must now choose a new Secretary of Defense. But I urge him to select a leader who shares Secretary Mattis's understanding of these vital principles and his total commitment to America's service members." 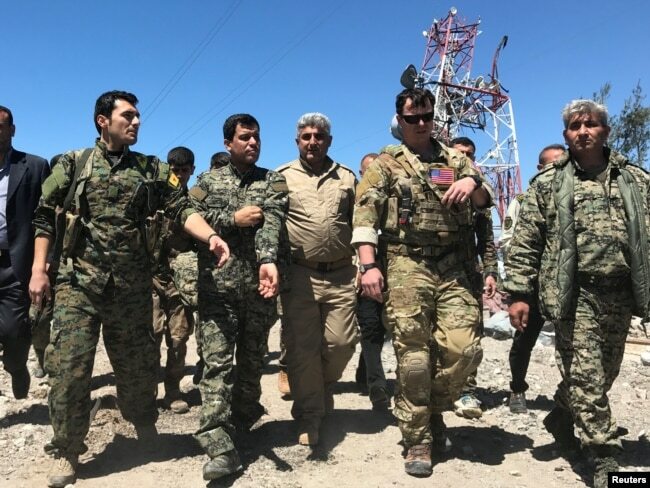 A U.S. military commander, second from right, walks with Kurdish fighters from the People's Protection Units (YPG) at Mount Karachok near Malikiya, Syria, April 25, 2017. "In one decision, the Trump administration abandoned two allies: Israel and the Kurds." "The American forces operating in the northeastern region of Syria, especially near​​ Al-Bukamal, bordering Iraq, constituted a final buffer between Iran and the Mediterranean Sea." "Iran has a presence in Iraq and in Lebanon, of course, as well. The US buffer in Al-Bukamal stopped the connection between the two." "The departure of US forces foreshadows the construction of a 'highway' that will offer a direct route for Iranians and Shiite militias between Tehran and Beirut. As a senior Arab diplomat explained to The Times of Israel, the development will allow Iranian Revolutionary Guards al-Quds Force commander Qassem Soleimani to drive straight from Tehran to the offices of Hezbollah leader Hassan Nasrallah in Dahiya, Beirut." "Beyond Israel, it is impossible to ignore the future of the Kurdish region of Syria [and in Turkey as well]. The United States has abandoned those who were its most important allies in the war against the Islamic State." "At one point the Kurds were the only force that managed to stop the Islamist terror organization. After the Iraqi and Syrian armies suffered losses at the hands of Islamic State, the Kurdish YPG forces endured fierce battles, fought until their last drop of blood, and managed to stop the terror organization on a number of fronts [most notably, in the northern Syrian city of Kobani]." "It is difficult to find fighters [both male and female] more heroic than the Kurds as they acted in the name of human rights and women’s rights. They were heroes, and especially heroines, who sacrificed themselves for humanity." "Nobody is declaring a mission accomplished. Defeating a physical caliphate is one phase of a much longer-term campaign." "We're not going to leave as long as Iranian troops are outside Iranian borders and that includes Iranian proxies and militias." "Pulling troops out of Syria in an ongoing fight is a big mistake. Like walking away from a forest fire that is still smouldering underfoot." "...Big winner is Iran, then Russia, then Assad. Wrong move." Kurdish fighters from the People's Protection Units (YPG) head a convoy of U.S military vehicles in the town of Darbasiya next to the Turkish border, Syria, April 28, 2017. Yet another impulsive determination by U.S. President Donald Trump, ignoring the advice of his top-flight military advisers, and leading to the resignation of his Defence chief James Mattis. The Trump decision to withdraw two thousand American military members from their vital role in supporting the Syrian Kurdish-led militias against the presence of Islamic State in their last remaining stronghold while successfully appealing to Islamofascist jihadis to join them, to the point where despite losing thousands of their fighters their fighter strength is back to where it was when their geographic caliphate was still intact, leaves both the courageous Kurds and the Israelis in the lurch. A scant two weeks earlier General Joseph Dunford, chairman of the Joint Chiefs of Staff declared there was still a long way to go for the U.S. in training local Syrian forces in prevention of an ISIL resurgence and to ensure the gradual stabilization of the country remains on track. It would require, he stated with the conviction of one who knows his trade and the situation before him intimately, 35,000 to 40,000 local troops in Syria's northeastern region to maintain security levels over the long term, while a mere 20 percent had yet undergone training. That speaks of long-term commitment. Commitment is a will-o'-the-wisp concept to Donald Trump, he relies on his never-failing intuition to guide his decision-making, no hard facts on the ground need intrude on this instinctive, deep-seated process that reflects the certainty of his reliance on his inner moods and convictions. Expert opinion, boots and observations on the ground be damned. Everyone must fall in line behind his behind, preferably humbly if not obsequiously as befits a commander-in-chief's infallible and cunning decision-making, for his decisions are all of that; infallible and cunning and no one can persuade him otherwise. He is the President of the United States of America. Look on his mighty works and despair -- with apologies to Percy Bysshe Shelley. Despair is what the Kurds, the sole local fighting forces, both men and women, who have never hesitated to meet the Islamic State terrorists in fierce combat, determined to protect themselves from the jihadis' barbarian influx and intentions must be facing at prospects for their future. Sometimes surprises should surprise no one. Trump, after all, broadcasted just that intention -- to withdraw U.S. troops during the presidential campaign that brought him to the Oval Office. His decision was made not because he consulted with his advisers but because he disagreed with his advisers whom he failed to consult, knowing their advice and opinions and contemptibly dismissing them. "This is, of course, an American decision", stated Israeli Prime Minister Benjamin Netanyahu, no doubt as taken aback and concerned as anyone else, with how this will impact on the Islamic Republic of Iran's ongoing controlling and dominating inroads into Lebanon and Syria. A decision which will inevitably bring closer to reality the potential of an all-out war with Hezbollah in Lebanon and the Iranian Republican Guard Corps and their Shiite militias enlisted by Iran at the Golan Heights in a presumed effort at a pincer movement that would animate Hamas in Gaza in a concerted, three-pronged attack on Israel. Aside from Iran, however, another country, a NATO member, Turkey, whose volatile Islamist president Recep Tayyip Erdogan appears to get on swimmingly well with Trump, will be delighted. 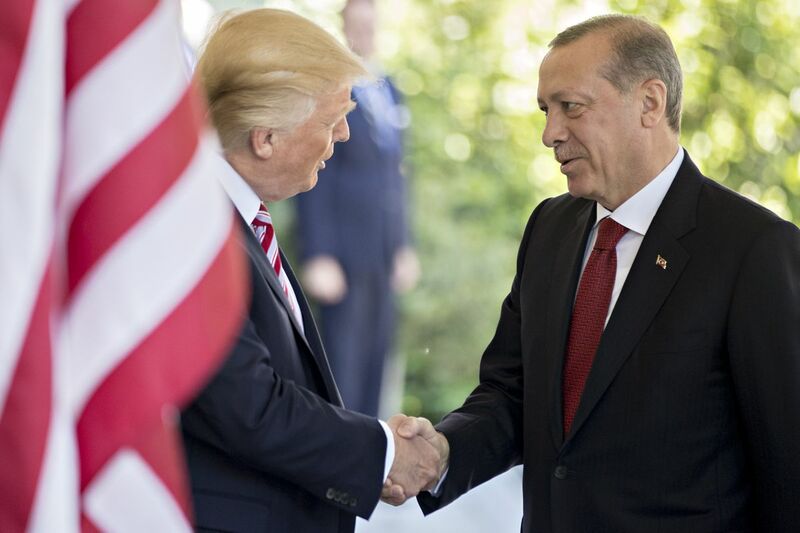 For Trump's decision gives Erdogan the green light he has long agitated for; that the U.S. discontinue its partnership with the Kurds, in essence protecting them by the presence of American military, from the intention of Erdogan to destroy the presence of Kurds adjacent the Syrian border with Turkey and as far beyond as he can manage. "This is a clear declaration of war. We take Erdogan’s threats against us very seriously. He has repeatedly expressed his desire to occupy our land in northeast Syria." "Our partners in the U.S.-led coalition are well aware of these Turkish moves because a Turkish attack against us can also impact the U.S. efforts to defeat [IS] terrorists." Now, it won't. The U.S. efforts have been summarily dismissed. And Erdogan has his green light. U.S. forces will be returning home. The Islamic Republic of Iran has free reign. Israel can prepare once again for its never-ending future of war. And the Kurds have once again been abandoned. "Do you want them cut or burned?" "I said, 'I don't know, what am I supposed to do? Just burn'." "We need to have the women believe and have faith that we are not speaking this and sharing this to the wind -- that this is going to go somewhere, that this will change a life." 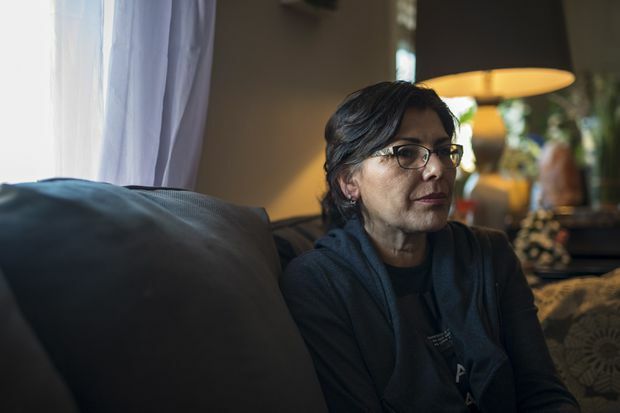 Deb Ironbow, who was coerced into having tubal ligation during a C-section in 1995, is photographed in her home in Saskatoon on Dec. 15, 2018. "I think a lot of these [Aboriginal] women thought they were alone and I think the reporting on it [coerced sterilization] and the investigation into it [morally unacceptable medical practise] really makes this country safer for almost immunizing [sic] women at the time of their greatest vulnerability." 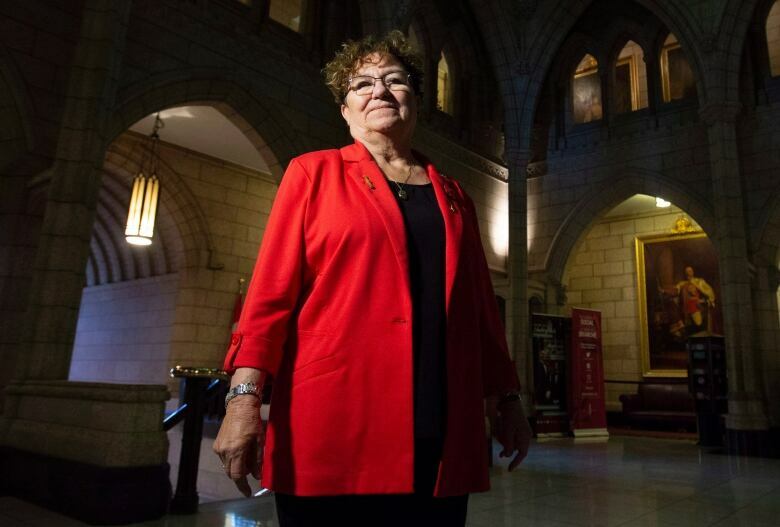 "If that [a clear action plan] is not part of the [government's action plan, then I worry about the whole guardian and ward process being implemented to address these problems and that would be the bureaucracy saying what's best or determining what's best for Indigenous women." "If it's happened in Saskatoon, it has happened in Regina, it's happened in Winnipeg, it's happened where there's a high population of Indigenous women. I've had many women contact me from across the country and ask me for help." An estimated hundred Aboriginal women have spoken publicly reporting they have been forcibly sterilized. A Saskatchewan law firm is now leading a proposed class action lawsuit against the Saskatoon Health Region. Senator Boyer's external review of the situation published in 2017 on the issue of Indigenous women coerced into tubal ligations after childbirth -- where the severing, burning or tying of the Fallopian tubes carrying eggs from the ovaries to the uterus -- would ensure they could no longer bear children first emerged, appeared to spur affected women to come forward. That public airing in turn influenced Indigenous Services Minister Jane Philpott and Health Minister Ginette Petitpas Taylor to send letters to the provinces, territories and medical communities serving them, highlighting "recent reports with troubling information" with respect to Indigenous women reporting sterilization procedures taking place immediately following childbirth which failed to seek their consent. Deb Ironbow was briefly questioned the method she would prefer done, while she was undergoing a C-section. Decades on, she is questioning why it was that she was asked about a "life-destroying act" at the very moment she was being operated on for a Caesarean section. She professes to having no confidence whatever in the working group tasked to examine the issue put into place by the Trudeau government. The coerced sterilization of First Nations women by medical practitioners represents a victimization of women unaware of what was being done to them, while they were in a vulnerable position. Nowhere does the story state any kind of potentially exonerating circumstances; that the women had a record of drug and/or alcohol abuse, giving birth serially to children suffering from fetal alcohol syndrome from their mothers' addictions, or women bearing a succession of children whom they neglect or abuse necessitating that the children be placed in protective custody. Even in such cases due process must be taken, with the mothers given every opportunity to seek counselling and reform much less their permission to proceed with sterilization. The government seemed to take notice of the situation when the United Nations Committee Against Torture ordered Canada to bring a halt to the "extensive forced or coerced sterilization" of Indigenous women and girls, sparking calls for federal action by human-rights groups within Canada. The allegations of human rights abuses; recent situations in Saskatchewan and others taking place elsewhere in Canada must be held to account. Former family physician Carolyn Bennett, now Minister of Crown-Indigenous Relations stated that the medical community has been placed on official notice that such coerced sterilization is utterly unacceptable, that querying women during active labour how they would prefer to be sterilized does not signify consent. "There may be more reporting that they were sterilized without proper and informed consent, against their will, in Winnipeg." "I think that the problem is quite a bit larger than we know it to be. And I think that it's quite a bit larger than we may, perhaps, ever know it to be, because not all women will come out and say that this happened to them." "We want to stop this from happening. Before you can really mend a wound, before you can heal, you have to ensure that the offence is no longer occurring." "Or that at least preventative measures are put into place to ensure that its likelihood is extremely diminished." "She is improving — but she is not out of the woods by any means. I believe she will survive. I think we’re winning here. I think she has made some progress in the last 24 hours. I’m not anticipating any more surgery. But anything can happen." "This is a super good person. This is the calibre of woman we’re talking about here. She goes around cleaning up other people’s garbage, out of the goodness of her heart." "For all of us who live here in Windsor, we can’t tolerate this. This is not just another assault. This is concerning to me. This is maybe representing a new, dark side of Windsor that we can’t let propagate." "She was a faithful and beloved member of our church, Riverside Baptist, and we will miss her dearly, but now she is whole and at peace in heaven with her Lord Jesus." "On behalf of Anne's family and our church family, thank you for your concern and prayers." "We are trusting the Crown to do due diligence in this matter and show the community of Windsor and all of Canada that they are looking out for the best interest of their citizens and to be strong and faithful advocates for justice and the protection of the innocent." Swedish-Canadians Sara Anne Widholm and her husband of 54 years Alfred, moved to Windsor, Ontario as their choice of a perfect place to spend their retirement years. Their children were grown and lived abroad, in Sweden, in Alabama and New York, and the parents took up their lives together in an area that appealed to them as they became an integral part of the community. They were members of the local Baptist church, and 76-year old Sara Anne established a regular route along a popular bike trail where she picked up litter. On the morning of October 8, 2017 she was walking the local Ganatchio Trail bike path, picking up litter when she was viciously attacked. Later, people passing by discovered to their horror an elderly woman battered and unconscious, immediately contacting authorities. Her list of injuries was long. It included multiple brain hemorrhages, the formation of a life-threatening blood clot, extensive fractures of the skull, and fractured vertebrae. Later, the very day the beating had occurred, police arrested Habibullah Ahmad, a 21-year-old resident of Windsor in connection with the crime. Windsor had accepted a fair number of Syrian refugees. Four weeks following the attack on his wife, 83-year-old Alfred Widholm died. It is uncertain whether his wife ever regained consciousness despite the medical care she received. She died at Windsor Regional Hospital on December 15. Their two sons, a daughter and seven grandchildren no longer live in Canada. Habibullah Ahmad who also uses the first name of Daniel, was charged originally with aggravated assault. A charge that was later upgraded to attempted murder. Denied bail, he remains in custody. Although Windsor police have not divulged any changes to the charge against the man as yet, it is now likely he will be charged with murder. "As we degrade their capabilities and push them into an ever smaller box, ISIS continues to employ more and more desperate measures." "U.S. and Iraqi politicians have been quick to declare victory over the group, using terms like 'defeated' and 'obliterated'." "The Islamic State is far from obliterated." "Do you think the Americans can defeat the caliphate? It's a war of attrition." "When the coalition stops the air strikes, we will return immediately." "We're still in Syria, even in the areas that you think we left. We still have our suicide bombers ready to attack." "Now they are beginning to use lone wolves in their attacks, supported by a cell of three to four persons." A small pocket of land located on the border between Syria and Iraq has been in Islamic State hands for over a year despite pressure from U.S.-backed militias and the Syrian military. The vast territory the Islamic State once held in both Syria and Iraq which just seemed to expand with each new ISIS victory over the demoralized, incapable Iraqi military and that of Syria more focused on targeting Syrian Sunni civilians than the terrorists, has been reduced to a pocket-sized territory where ISIS has dug in among thousands of civilians. From the Syrian town of Hajin toward the end of November a breakout was staged where an attack against the Syrian Democratic Forces in Gharanij took them by surprise and resulted in a large number of casualties. The event was explained away by Maj.Gen.Roberson as a freak advantage of bad weather,when sandstorms prevented airstrikes. It was good strategy and coordination by a large group of battle-hardened terrorists, a reality that the U.S. military is obviously loathe to admit. They may have lost their caliphate's broad territorial gains and their capital Raqqa, but the Islamofascist ideology that inspires and carries them forward in jihad burns as strong as ever; like the Taliban in Afghanistan they retreat when seen as a required tactic, await new opportunities and strike whenever feasible -- and in the process leave their trademark sacrifices to Islam. The propaganda that was so hugely successful in their terrorism potential to strike fear into the minds of all those they targeted remains intact. Their broadcasts continue aggressively as though their power and their territorial caliphate had never been reduced. Their digital caliphate remains robust and capable of attracting new recruits. They have maintained a level of security in Diyala Province in Iraq through the use of roadblocks. They have succeeded in kidnapping and slaughtering Iraqi government officials and engaging in shooting battles with Iraqi troops. According to ISIS expert Maxwell Markuson there have been more frequent Islamic State attacks this year than had occurred in 2015. Two years ago, 60 monthly attacks took place, that was advanced to 75 a month more recently. Thousands of its fighters have been killed or captured in the last year, but they appear to have little concern as replacements continue to fill the ranks diminished by those conflicts. An estimated 20,000 to 30,000 ISIL members remain to fight for their cause in Iraq and Syria. What that number represents is equal to the totals that represented the Islamic State caliphate when it was at its greatest strength, in 2014. Back in September the Syrian Democratic Forces announced a "final push" against the remnants of Islamic State in Hajin. The fighting to overcome their forces is a difficult one, observed U.S. authorities since ISIS fighters have nothing now left to lose; their diminished territory and capabilities leave them with everything to gain should they succeed. The Hajin area hosts an estimated 2,000 to 2,500 fighters which speaks to the ferocity of their determination and the defenses they have put into place to secure their victories. Accusations of their use of civilians in the area -- numbering roughly 7,000 -- as human shields may enrage the U.S. and the Syrian Democratic Forces but cut no ice with terrorists who demonstrated to the world their enjoyment in horrifying onlookers reacting to their relish of imposing gruelling and gruesome deaths on those they captured. Since the "final push" in September, 827 Islamic State fighters and 481 Syrian Democratic Force fighters along with 308 civilians have been killed. The Syrian Observatory for Human Rights monitoring group based in London, England, lays the blame of civilian deaths to the airstrikes -- courtesy of the U.S.
"[Three-day-old Amiad Ish-Ran had] managed to unite the nation of Israel [like few others had done before him]." "You brought so much light. And with all the light that you brought [Amiad Yisrael] we will extinguish their darkness." "They were normal people standing at a bus stop." "Brand new, young couple, have their own little place, they're renting -- everything you would think of for a nice, normal, young family to be." "And then it all got destroyed by this terrorist." Nothing normal, however. They were Jews. Jews living in Israel. Dual citizens; Canadian-Israeli. Targets. 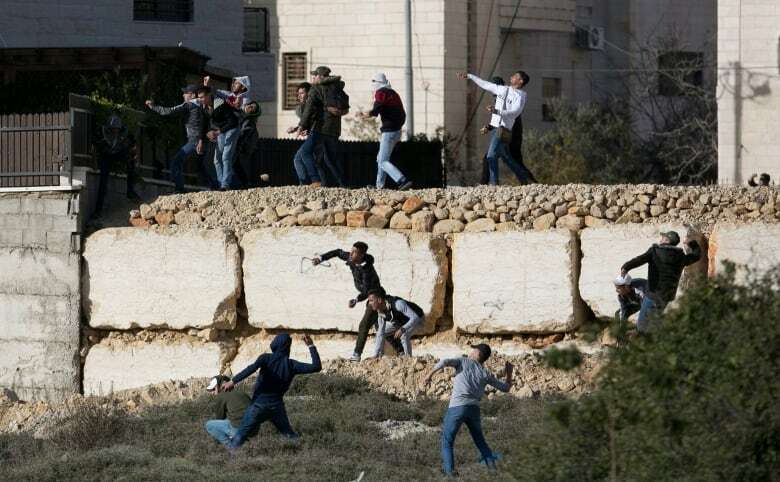 Normalization is not viewed favourably by the Palestinian Authority. Normalization means accepting the presence of a Jewish state in an Islamic geography. Islamic theology has it that land consecrated to Islam must never fall to another religion; it is forbidden by Sharia law. Palestinians who sell land to Jews can receive the death penalty. More likelier extra-judicial penalties of immediate death, bypassing and dispensing with the annoying interference of a trial. The presence of Jews in territory that Palestinian Arabs claim as their own although they also claim the territory on which Israel has been established as their own -- represents an enormous abnormality. One that must be 'resisted' as a hateful 'occupation' of Palestinian heritage. The ancient biblical presence of Judea and the Israelite thousands of years of residence in a geography whose history is chronicled through many sources, both biblical and chronologically historical of the time becomes meaningless and expendable in Palestinian claims of pre-historically occupying the land. Before the Almighty revealed the final scriptures of sacred instruction to the faithful, antedating Jewish regional history, it was all consecrated to Islam. Jews, according to Arab Palestinian authorities, have always been illegal occupiers, millennia distant to the present. So when 30-week-pregnant Shira Ish-Ran with her hisband Amichai waited at a bus stop outside a the West Bank settlement of Ofra along with a group of other Jews it was only logical that they be ambushed by gunmen opening fire at them from a moving vehicle. The gathered crowd of Jews scattered immediately; recognition of an impending atrocity comes easily to these people who have experienced so many of these killing sprees either personally or through the personal accounts of friends and family, for everyone has mourned those deaths and the survivors' recoveries have become legendary. When the 23-year-old rabbinical student Amichai looked back to see his wife on the ground, he leaped to shield her from the rain of bullets. Shot three times in the leg, his wife, 21-year-old teacher-in-waiting, shot in the back. They survived, hospitalized, sedated, undergoing surgeries and a gradual recovery. Their son was delivered by Cesarean section with the hope he would live, and he did, for three days. 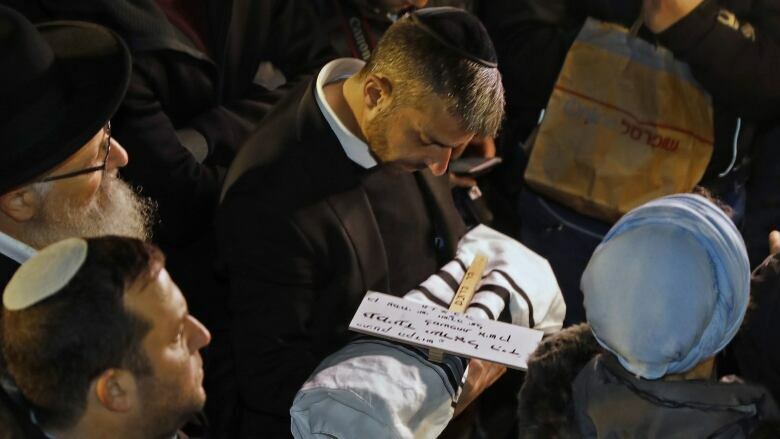 Their baby, wrapped in a prayer shawl, surrounded by family, was last seen by his parents from their hospital beds, then was buried at Mount of Olives cemetery in Jerusalem. The baby Amiad Yisrael was murdered by 29-year-old Palestinian Salah Barghouti a member of the terrorist group Hamas. Salah Barghouti was taught from the time he was an infant -- through school curricula, through plays and television, through the 'normal' life of Palestinians incited to hate Jews and to pledge their futures to the 'liberation' of Palestine from the unworthy hands of Jews -- to become a martyr in jihad, to restore Palestine in its entirety, that 'Palestine' that was always associated with Jews called Palestinians. Now he has become one such martyr. 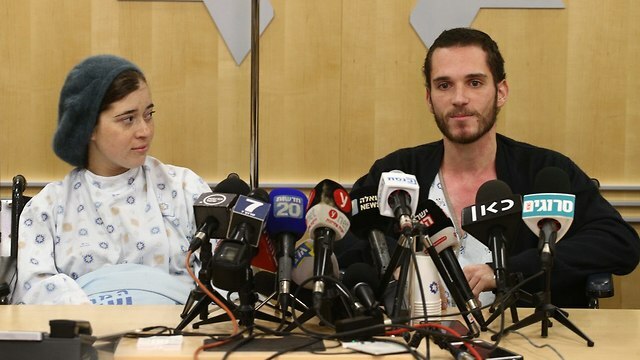 Amichai Ish-Ran's brother, a member of the IDF, watched live via surveillance footage as the shooting occurred, reacting by sending emergency personnel urgently to the scene. "He didn't know it was his brother, because it's not that detailed a camera", explained Montreal lawyer Charness, both young men's Canadian uncle. "During the three days our baby lived, he united us —secular, religious, ultra-Orthodox, right and left wing, who came to support us. I'm proud to be part of this nation,"